You can configure transparent POP3 proxying. Anti-Spam's transparent POP3 proxying captures POP3 traffic without the user's knowledge, and automatically scans it for malware, viruses and unsolicited content. This ensures that email downloaded from POP3 servers is subjected to scanning without requiring every employee to install expensive email anti-malware software on their workstations. You can configure Anti-Spam to retrieve POP3 email traffic and automatically scan it for malware. 1. Go to Email > POP3 > Proxy. Enables anti-malware scanning on relayed email. The malware name in the body of the email alert. The IP addresses of both the client connecting to download email and the POP3 server. • Interface name — Select the interfaces you wish to proxy POP3 traffic. 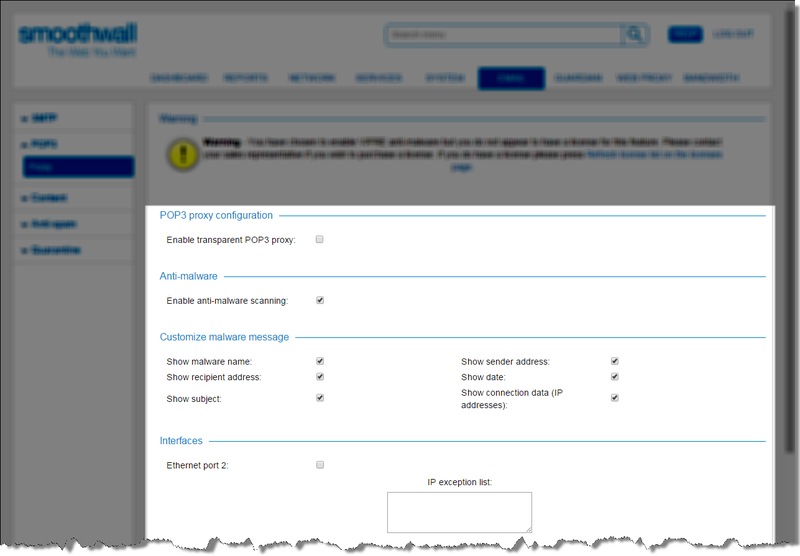 You must select at least one internal interface for the POP3 proxy to work. • IP exception list — IP addresses allowed to download email via POP3 without being proxied. 5. Click Save and restart to reboot your Smoothwall.